Tackling Football: A Woman’s Guide to Understanding the College Game provides women with the basics for understanding a college football game – how it is played, including the various playing positions, and basic offensive and defensive strategies. It includes a close-up look at what happens before, during, and after the game, as well as how to listen to a play-by-play. It is written in a “user-friendly” format and is drawn from our combined years of experience with college football as spectator, player and coach. We feel that few things in sports compare to the excitement of a weekend college football game – from socializing with friends at the pregame tailgating parties to the energy of the crowd cheering their team’s touchdown over a rival. We want others to have that experience and share in our love and appreciation for the game. For the DELUXE version of the book – which is spiral bound with laminated pages – click here. This water-resistant version is ideal to take to the game in any weather! A perfect gift idea. For the colorful paperback click here. For the Kindle click here. For the Nook click here. For those with iPad, iPhone iPod touch click here. For those with a Sony reader click here. 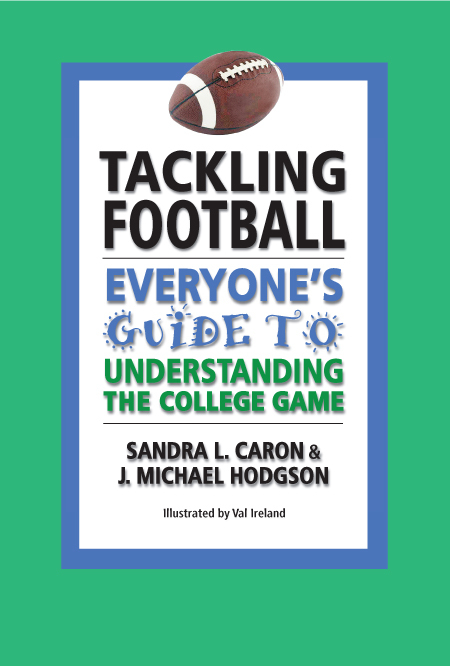 Tackling Football: Everyone’s Guide to Understanding the College Game provides fans with the basics for understanding a college football game – how it is played, including the various playing positions, and basic offensive and defensive strategies. It includes a close-up look at what happens before, during, and after the game, as well as how to listen to a play-by-play. NOTE: This book is essentially the same as our earlier book, A Woman’s Guide. We have changed the introduction and color scheme to make it appealing to both men and women who want to learn more about the game of football. "Tackling Football is outstanding and was VERY well received in our home – my wife Mary loved it!" "A much needed and long overdue look at college football for those who think they know, but don't. An understandable guide to not only what goes into the game, but gameday itself. It will undoubtedly educate those who have been afraid to ask. I'd like my wife to purchase this first copy!" "The book was a tremendous addition to our Women's Clinic at Princeton this spring. Many of the participants are friends that I saw often this summer at our children's events and they continue to comment how helpful it has been. Sandra Caron and Mike Hodgson have done an exceptional job taking a game that can be considered complicated and breaking it down in a way that is easy to follow."